Volcanic eruptions have been known to affect the Earth's climate, but scientists have found it difficult to quantify by just how much. In the past, these eruptions are thought to have triggered crop failures and famines and may have also contributed to disease pandemics and a decline in agriculture-based communities. Now, using new records, a study suggests large volcanic eruptions were the dominant drivers of climate variability. 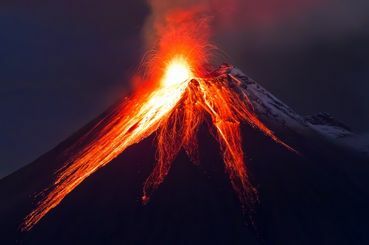 An international consortium of researchers, led by scientists from the Desert Research Institute (DRI), quantified the impact of nearly 300 eruptions over the past 2,500 years on climate variability. The researchers constructed a timeline that showed that 15 of the 16 coldest summers recorded between 500 B.C.E. and 1,000 C.E. occurred after large volcanic eruptions. They found that four of the coldest summers happened shortly after the largest volcanic events found on record. When a volcano erupts, it releases large amounts of sulfate particles into the atmosphere. Once these particles combine with oxygen and water, they form sulfate aerosols, which can persist for two to three years. These aerosols can shield the Earth’s surface and block out incoming sunlight, which results in cooler temperatures. "We used a new method for producing the timescale," said Mai Winstrup, a researcher at the University of Washington, Seattle, in a statement. "Previously, this has been done by hand, but we used a statistical algorithm instead. Together with the state-of-the-art ice core chemistry measurements, this resulted in a more accurate dating of the ice cores," added Winstrup. The researchers hope their study provides answers to some long-standing questions on the cause of a mysterious cloud that lasted for 18 months in 536 C.E. in the Mediterranean region. The cloud resulted in cold summers that persisted for almost 15 years, which resulted in crops failing and widespread famine. Researchers have linked this cooling event with two volcanic eruptions, one in the Northern Hemisphere and the other in the tropics. Researchers also speculate that this weather anomaly could have contributed to the dissemination of the ‘Justinian plague,’ a pandemic that spread through the Eastern Roman Empire and ultimately killed millions of people. The reconstruction in the study, published in the journal Nature, was created by analyzing aerosols in more than 20 individual ice cores from ice sheets in Greenland and Antarctica. Researchers also used historical documents and analyzed tree rings to create a year-by-year record of atmospheric sulfate levels. Well, there is nothing much we can do about volcanic eruptions, is there...?